The STANLEY THS-230T Tilt Mount is for larger Flat Panel TVs. The THS-230T Tilt mounting system features a slim and sleek design for a clean and low profile appearance. Up to 130lbs max TV weight. The STANLEY THS-230T Tilt Mount is for larger Flat Panel TVs. The THS-230T Tilt mounting system features a slim and sleek design for a clean and low profile appearance. With only a 1" depth from the TV to the wall, it saves space in the room and is a safe way to display your TV while providing an optimal viewing angle. Configured to 16" and 24" Stud Systems for secure installation. 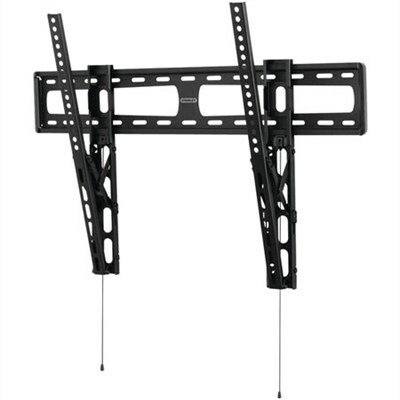 Large wall bracket for accommodating wiring and power access behind the TV. The "Click and Release" system permits easy access to the rear of the TV without special tools while securely affixing the TV to the wall. TV Size: 46" - 90"
Product Net Weight: 5.0 kg/11.0 lbs.